The scrapping of a fire control centre which was to control call-outs in Cornwall has been welcomed by the county's unitary authority. The Labour government announced a plan in 2005 to replace Cornwall's fire control with a facility in Taunton, Somerset, covering south-west England. The coalition government has announced that the project is to be scrapped. Lance Kennedy, of Cornwall Council, said he was "pleased that the uncertainty has been ended". 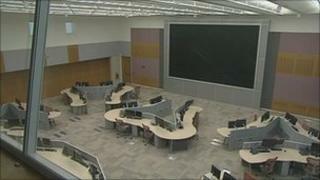 The Taunton centre was to be one of nine regional sites in a £423m scheme to replace 46 fire control centres in England. It would have dispatched fire crews in the Devon and Somerset, Dorset, Avon, Cornwall, Wiltshire and Gloucestershire brigade areas. The centre was built but has been standing empty for about three years because of problems with its computers. It was due to open in May 2011. Critics raised concerns that if local knowledge was lost because calls were being answered in Somerset instead of Cornwall it could affect response times and risk lives. The county's fire service is administered by Cornwall Council. Mr Kennedy, the council's cabinet member for community safety, said he was to work with the Department for Communities and Local Government on future funding and business plan submissions. He added: "I have arranged meetings with Cornwall Fire and Rescue Service Chief Fire Officer for January when we can further discuss the county's requirements. "This announcement allows us to progress our own destiny and will have no effect on front-line service provision or any reduction to public and staff safety." Fire Minister Bob Neill said agreement had been reached with main contractor Cassidian to end the project. The Fire Brigades Union welcomed the decision as "long overdue".